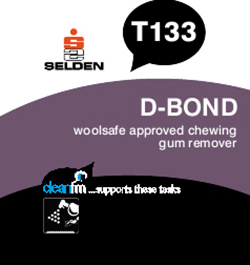 For removal of chewing gum from all types of carpet. Performance is best on dried gum. Ideal for pubs, clubs and all carpeted public areas. ** N.B. Test a small inconspicuous area of the carpet for colour fastness before commencing cleaning. ** It is essential that you test the carpet for colourfastness prior to use. Spray liberally over the chewing gum and immediate surrounding area. Wait for a few minutes for the chemical action to take place. Using a blunt edged scraper and/or cloth - gently peel the gum from the carpet, taking care not to damage delicate fabrics. After use rinse out with water or a suitable extraction shampoo using an extraction machine.